Apple updated three of it’s applications today. The iTunes 8.2 update adds support for iPhone or iPod touch with 3.0 software. It also “includes many accessibility improvements and bug fixes”. iTunes 8.2 file site is 80MB. 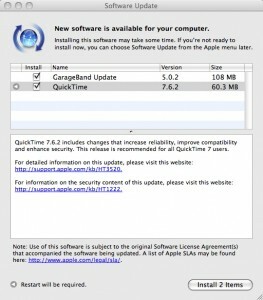 Apple also updated QuickTime to 7.6.2 to increase reliability, improve compatibility and enhance security. The update plugs gaping QuickTime security holes according to ZDnet. For detailed information visit this page and for information about the security update visit this one. The update is 60MB. GarageBand 5.0.2 Update was also released. This update “addresses general compatibility issues, improves overall stability, and fixes a number of other minor issues” and is 108MB. The updates are available from the Apple Software Update or you can download them directly: iTunes, GarageBand 5.0.2 and QuickTime.